So, are markers art supplies? By markers, I of course mean dry-erase. Is the whiteboard the canvas of the classroom? I don’t know, but I would count dry-erase markers as art supplies so I’ll talk about them briefly. 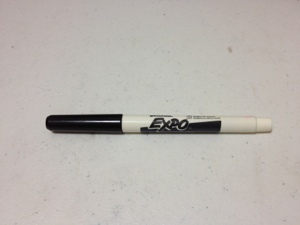 I’m going to focus on the pen-type variety of the EXPO marker. They are small, pen-size. They fit in the hand nicely and don’t slip despite the glossy finish.The cap holds well, but it has no clip so it won’t stay in one’s pocket. 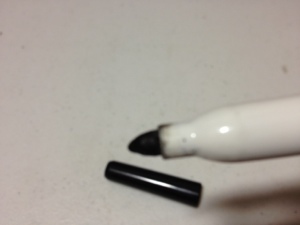 The ink of this particular one is black, it goes on smooth, dries fast and is nice and bold. It stays well and looks nice and sharp. It obviously doesn’t have much line variation but the point is fine enough that one can achieve most of what they would want to. When one is done the ink comes of easily with an eraser. The smell has also been reduced (though not eliminated) and the ink is thankfully non-toxic.